One year I was trying to think beyond the normal trinkets and gift cards for teacher gifts and stumbled upon this idea. What teachers wouldn’t love knowing that the gift of education has been given in their honor for needy children across the world? The World Vision ”catalog” offers a variety of options for different budgets. If you’re like us, it’s still more than we normally spend for a single teacher. So, we decided on a budget for all the teachers combined, chose the item(s), printed out descriptions of the gift item(s)from the website, and made Merry Christmas notes that money was given in their honor toward the item(s). We got wonderful responses from the teachers. They were so touched and grateful for such a thoughtful and meaningful gift in their honor. We created the one in the picture when my kids were preschoolers, but I’ve kept it with our Christmas decorations and we pull it out every year to hang in our game-room. 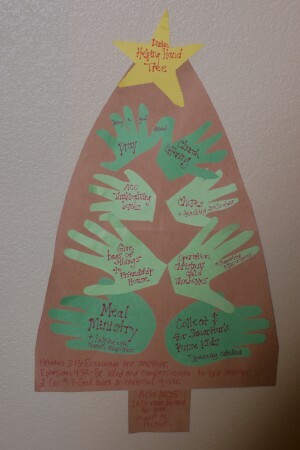 It serves as a good reminder of ways we can help others, not only at Christmas, but throughout the year. We haven’t added to it in several years, but I think we will at some point this season for a family devotional. Now that the kids are older and we have new ways of helping others, it will be interesting to hear their input and let them do the writing…and let them compare handprints to see how much they’ve grown! As a little girl, my mom helped me memorize Luke 2…Charlie Brown Christmas style (aka King James Version). 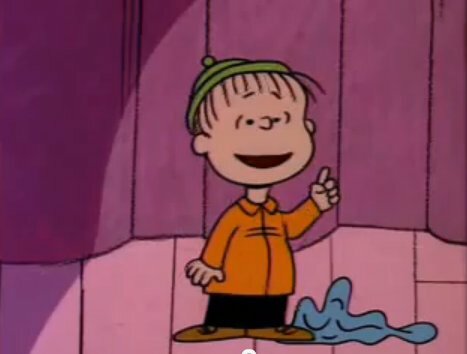 It was always fun for me to be able to say the whole thing along with Linus. As a mom myself, I’ve enjoying carrying on the tradition with my kiddos. When they were younger, I’d keep a print out of Luke 2:8-14 (http://www.biblegateway.com/passage/?search=Luke%202:8-14&version=KJV) in the car and we’d work on it during car time throughout December. Each year, it would get easier and easier as they remembered it from the past. Last year, my daughter encouraged us to add more from the chapter. Now we are working on solidifying verses 1-7 and 15-20 (http://www.biblegateway.com/passage/?search=Luke%202:1-20&version=KJV). 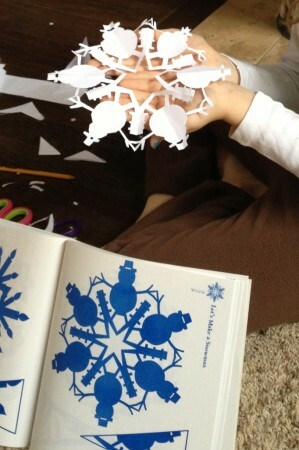 This idea works well for families or groups with children of all ages. Print out a copy of Luke 2:1-20 from The Message version of the Bible. I’ve pasted the passage below for your convenience. Feel free to cut and paste into a Word Document to print. Cut apart sections of the passage, making as many strips of verses as you wish, depending on how difficult or easy you want the activity to be. Tape each strip to a popsicle stick (picture below). 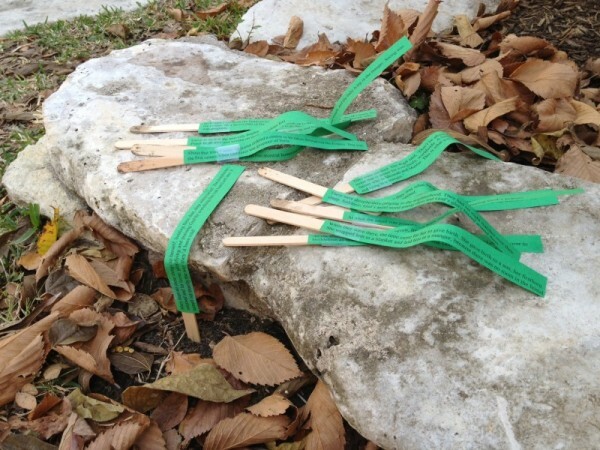 Hide the sticks in the yard and then have the kids go on a scavenger hunt to find them. Once gathered, the older children can work together to put them in order. Then read The Message version out-loud while they check to see if they got the order correct. Because my children are familiar with the KJV and NIV versions of Luke 2, it was fun for them to hear the more contemporary language version of the passage through The Message. We particularly got a kick out of the term, “sheepherders.” Guess the word, “shepherd” is outdated?! About that time Caesar Augustus ordered a census to be taken throughout the Empire. This was the first census when Quirinius was governor of Syria. Everyone had to travel to his own ancestral hometown to be accounted for. So Joseph went from the Galilean town of Nazareth up to Bethlehem in Judah, David’s town, for the census. As a descendant of David, he had to go there. He went with Mary, his fiancée, who was pregnant. There were sheepherders camping in the neighborhood. They had set night watches over their sheep. Suddenly, God’s angel stood among them and God’s glory blazed around them. They left, running, and found Mary and Joseph, and the baby lying in the manger. Seeing was believing. They told everyone they met what the angels had said about this child. All who heard the sheepherders were impressed. Apologies if you’ve already received this. Final kinks being worked out with e-mail distribution lists from new website. Hoping you only one of each update from now on! Thanks for hanging in there with me through the multiple e-mails as we figured it out! Don’t you just love it when you are reading a good fiction book and you glean an unexpected nugget of wisdom?! This excerpt, from the Dearest Dorothy series that I absolutely adore, perfectly portrays a situation typical to those of us who have young daughters. I can totally see this happening at my house and am glad for another tool in my parenting tool belt for how to approach times like this. Read on to add to your tool belt! From DEAREST DOROTHY, HELP! I’VE LOST MYSELF by Charlene Ann Baumbich, copyright (c) 2004, by Charlene Ann Baumbich. Used by permission of Penguin, a division of Penguin Group (USA) Inc.
“I see a girl who does not want to wear her dumb blue dress to church today,” Dorothy said with a humph of finality. “Look at me! I look perfectly fine in my pink sweater and dungarees,” she proclaimed, her face pinched into a wad of storm. Ethel tucked her lips inside her mouth, damming a torrent of sharp words ready to burst out of her. She stared at her daughter’s set face, then watched her cross her gangly arms across her chest, clearly reveling in her last statement, which was, at its root, inarguable-and they both knew it. Ethel had long ago learned, however, that neither diatribing nor debating would move Dorothy Jean toward Ethel’s intentions. No, you had to beat Dorothy at her own strengths, and that took prayer, creativity and unending patience. While Ethel engaged in mental gymnastics, she mindlessly crossed her arms against her chest as she studied her own midlife face in the mirror, as if appealing to it for answers. Her eyes scanned their framed reflections. Without a doubt, these two females were the shadow images of each other’s stubbornness. Lord have mercy on us both, Ethel prayed in silence. 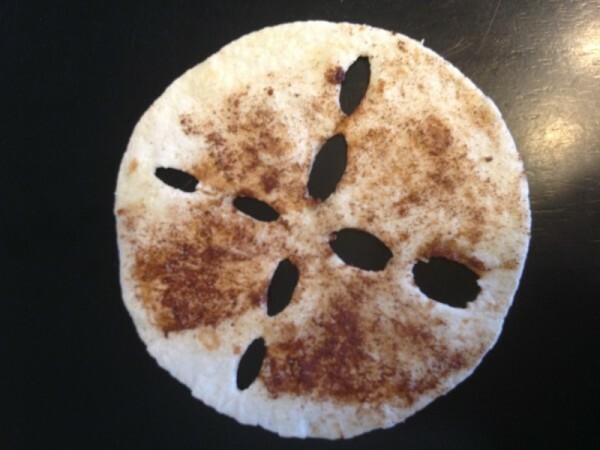 Just then the old Register clock in the kitchen began its ten-gong pronouncement that church would begin in thirty minutes, barely enough time for them to finish dressing, pack up and get to town. Mother and daughter spent a few moments moving nothing but their eyes between their reflections. Pretty soon it became impossible not to giggle, which is exactly what they did. “We do,” Dorothy said, her heart erupting with love for her mother like an explosion of happy feathers. “Let us determine right here and now,” Ethel said, resting her hands on her daughter’s shoulders, “that when we find we haven’t been smiling enough, we will talk to our smiles to encourage them, okay? We’ll talk to our smiles until they appear, so that when we look in he mirror we can smile back at them.” Ethel then leaned over and kissed the top of her daughter’s fine brown hair, her warm breath melting Dorothy’s remaining resistance. Without another word Dorothy Jean Brown quickly changed into her blue dress, casting a hurried eye into her dresser mirror each time she passed it, just to make sure she was smiling back at…her smile.